Located in Jalan 225 Section 51A Axis Business Campus is within prime location of Petaling Jaya and is in close proximity to the Federal highway. Consisting of 2 multi functional buildings Block A is a 4 level office building with a ground floor perfect for showroom usage whilst Block B has 2 levels with industrial floor strength capability and a roof top car park. Per floor plate is from 11,000 square feet up to 54,000 square feet. 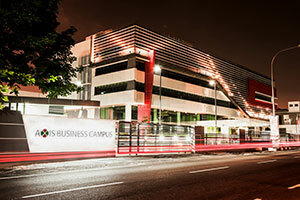 Undergone recent refurbishment Axis Business Campus has great accessibility to arterial trunk roads such as the Federal Highway, Damansara Puchong Highway, The New Pantai Expressway and Sprint Highway.